We wish you a merry Christmas and a happy New Year! May it be full of surprises, happiness and great rides. Read Jo’s interview on Morznet.com. The season in Morzine is coming to an end for us (but the lifts are open for a few more days), thanks to those who rode with us and see you very soon! RideAbility offer you to join us in Cal Pai for 3 days (26ths, 27th and 28th of May) of riding on our favourit singletracks. A great way to discover some amazing trails, wild and technical, improve your riding skills and enjoy some great cooking! Read about Jo in issue 17 of WideOpen magazine (p.77). The first stage of the Enduro Series will take place in font Romeu on the 26th and 27th of May. The Enduro Series is the official National Enduro Cup, it’s a stage race where only the descents are timed, no training on the track and natural single tracks only. Another particularity is each racer is equiped with an electronic chip and can start whenever he fancies, so you can ride with your mates.Registration opens on the 1st of February, be quick places sell like hot cakes! Our gîte, is located only 10min away from Font Romeu, with its pumptrack and great food (everything home made and cooked by Françoise), it’s an ideal accomodation. Jo can help you sharpen your technique for race-day (and the rest of your riding life!) and show you around his favourite trails, so why not come over and discover the area with us ? Give us a shout ! 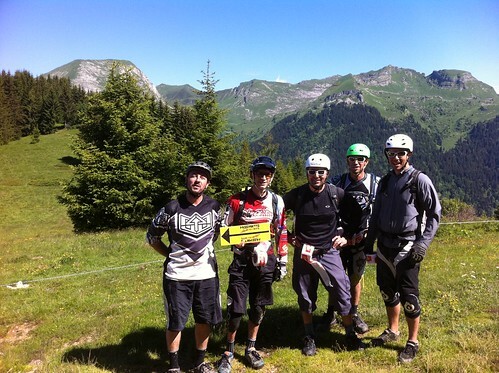 The MTB season is about to start “for real” (some areas have been open since early June) in the Portes du Soleil. The Pass’ Portes (big event where 5500 riders will ride a loop around the area and eat a lot of cheese!) is the opening date for the whole area and… it’s this weekend! Come and discover Europe’s biggest mountain biking area and improve your technique at the same time… see you soon! Jo has been appointed to coach for the Châtel Mtb club this summer alongside Seb Giraldi and Ben Walker, exciting times!